The Minigarden Basic S Pots tabletop garden is the simplest way for gardeners of any skill level to grow thriving plants with minimal effort. It’s unique water and nutrient reservoir automatically waters plants as they need it, taking the worry out of gardening and ensuring that you can enjoy a prosperous wall-mounted or tabletop garden in any space. 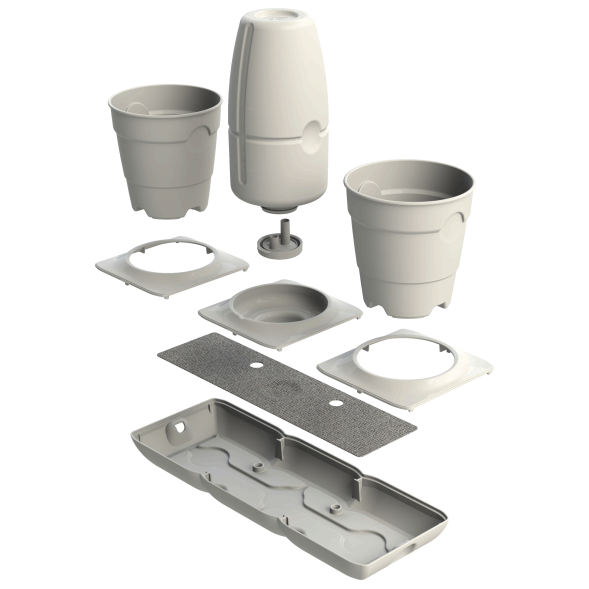 Minigarden Basic S Pots is manufactured using BPA-free, 100% recyclable plastic, and offers UV protection as well as protection from extreme weather conditions. Insert the Pot Holding Rings and Water Reservoir Ring onto the base tray in the desired order. The pots can be placed side-by-side, or separated by the reservoir. (Optional) Pour the contents of the nutrient pack into the Water Reservoir. Each pack is pre-measured for use with 42 oz (1.25L) of water. Fill the 1.25L Water Reservoir to the top with water and click the Feeder Cap on securely. If using the Minigarden pots, transplant your plants to the Minigarden pots. It is important that the soil and root mass make contact with the holes at the bottom of the pot to ensure that the plant can draw moisture from the base tray. Alternatively, if you are using the same pots that the plants were purchased in (fits 4” to 5.5” pots), it is essential that the pots have holes on the bottom and that the soil and geotextile underlay have some point of contact.